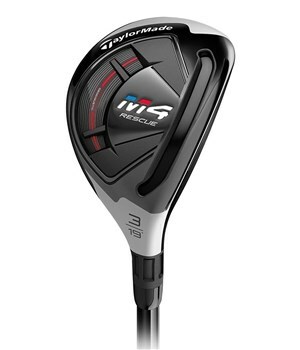 The TaylorMade M4 rescue has all the features and benefits that will ensure it quickly becomes your ‘go to’ golf club when you are in trouble. TaylorMade have given the M4 rescue a low CG location for easy launch, a confidence inspiring shape that is easy to hit from the tee, fairway, rough or even those dinky chip-and-run shots around the green. The two-tone crown design promotes easy alignment and a consistent set up. To give you incredible levels of playable performance TaylorMade have refined their Speed Pocket design, the refined version is longer to provide an even bigger sweet area on the face. The inclusion of the Speed Pocket also produces incredible ball speeds right across the whole face so anything off the face (even the worst mishits) will get into the air and land closer to the target. To seek out as many yards as possible from the tee TaylorMade have fitted the M4 rescue with the premium Fujikura Atmos Red shaft as standard. This shaft has a mid spin, mid-high launch profile that will help most amateur golfers. Two internally split mass pads that increase inertia to deliver more ball speed across the face. Two-tone crown cosmetic in a low profile shape provides a confidence-inspiring look. Our revolutionary Speed Pocket has been lengthened to increase flexibility and distance across the face. Low-face strikes will be rewarded with the improved Speed Pocket by preserving ball speeds for consistent distance.